As a new business owner, you’re constantly on the lookout for effective and affordable marketing methods. You want to funnel your precious marketing spend into methods that work. Furthermore, you don’t have tons of money to waste. You need to make smart decisions that will help your company, both in the short and long term. 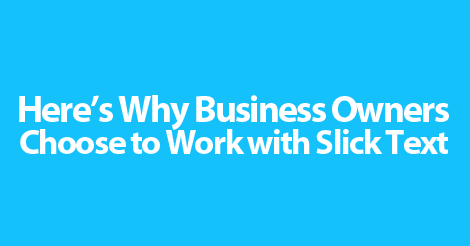 At Slicktext.com, we’re thrilled to be partnered with tons of small business owners. Nationwide, our solutions seem to ring a bell with these savvy, business minded individuals. When compared to the competition, what is it about Slick Text? What makes us the go to online texting service for small business owners? Our customer support professionals are always ready to answer your questions or address your concerns. We’re just one simple phone call away. We don’t charge your card, and disappear. We stick around, and walk you through the entire SMS marketing process. We’ll never sell you something you just can’t afford, or don’t need. We’ll never talk you into signing a contract, or making any upfront commitments. Our service is hassle free, simply because we believe in our solutions. We’re constantly cranking out new educational resources. We produce guidebooks, infographics, videos, and so much more. Why? It has nothing to do with selling our product, and everything to do with empowering you to succeed. At Slicktext.com, we’re here for our customers, bottom line. We’ll never leave you hanging, or fail to give you the tools needed to succeed. Join forces with the best online texting service, Slicktext.com. Want to learn more? Give us a call at 1.800.688.6290, or hop over to the pricing page and sign up for a free plan. Our feature rich platform boasts dense educational tools that empower even the newest business owners to succeed.